Have you been searching for the best looking business desk phone on the market? ShoreTel IP Telephone has raised the bar on business phones with their latest model, the 655 IP Telephone. This new model truly gives any user a real-time telephony experience. This IP phone is ideal for any small to midsize business. Whether you are an administrator or executive this IP Phone gives you endless options to enhance your daily communication experience. There are many new advanced features with the ShoreTel 655. To begin, the large color touch screen with 12 line appearances. This 640 X 480 color back lit display is the biggest Shoretel has to offer with more soft keys and line/call appearances to help increase functionality. The touchscreen has haptic (vibration) feedback which makes it very easy-to-use. In this day and age, most of us are carrying around our very own touch screen, now when we walk into the office we can continue on using a touch screen. The fact the screen is a touch screen helps to solidify the phones status as the flagship. 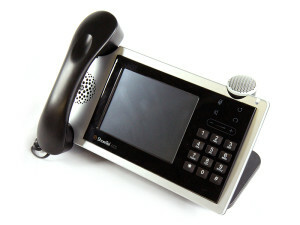 The features of the touch screen don’t stop there, the ShoreTel 655 can be personalized. Users can customize various aspects of their phone’s behavior, such as the background wallpaper. You can personalize your business phones by adding your companies logo to the background wallpaper of your phones. Advanced microphone technology helps deliver the most superb sound through the speakerphone. The 360 degree microphone and full duplex speakerphone makes it a perfect fit for any size of conference room. On top of these microphone capabilities, this model also allows for a six element mic array. The ability to accept external microphones is what sets the ShoreTel 655 apart from their competition. The visual voice mail simplifies voice mail management for professionals, contact center agents and executives. The voicemail viewer application brings your voicemail right to your fingertips. Users are presented with their list of voicemails that can be played from the Inbox, Saved or Deleted tabs. There is also a progress bar that is displayed with controls to pause or play your messages. The built in 2 port Ethernet switch allows for higher network performance between the phone and your desktop. The ShoreTel 655 supports the G.722 HD voice codec, allowing for a much higher quality voice conversations than traditional phones. In addition, the IP phone offers an integrated VPN client for remote tunneling the phone across the WAN. ShoreTel is a flexible and easy-to-use system that anyone and everyone can handle. The ShoreTel 655 is another great addition to the many impressive models ShoreTel has to offer. This entry was posted in Blog, ShoreTel and tagged ShoreTel 655. Bookmark the permalink.